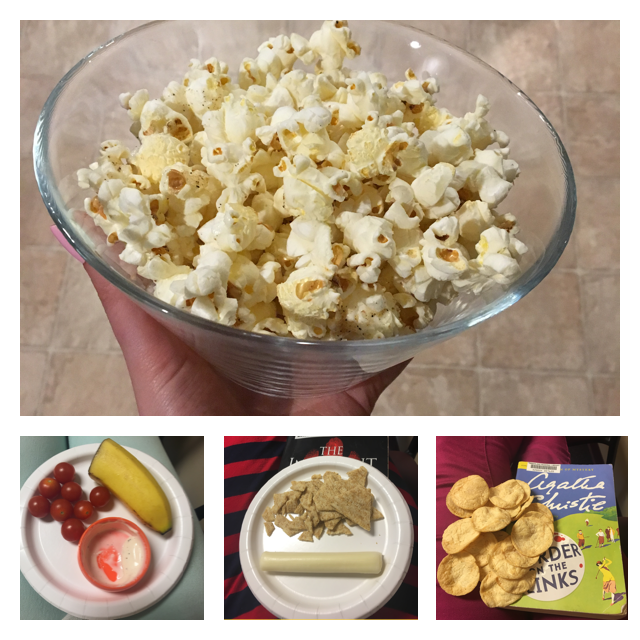 For me, snacks are key to carb counting survival. In general, I feel satisfied after eating a carb-controlled meal but I’m finding myself hungry 2-3 hours after the meal. Snack time! Ideally, a carb-controlled snack for my plan would have 15-20 grams carbohydrate and some protein (even better if it adds in fiber too!). The carbohydrates keep my energy up while protein helps keep the carbohydrates from raising blood sugar too quickly. My struggle is I’m finding the protein portion tough for some reason. My challenge is that often snack time ends up being on my breaks at work, and proteins are either tough to pack or they need preparation and/or refrigeration. I did a stint with mozzarella cheese sticks and they worked out really well but I got a little bored with them. I haven’t been able to make it to Winco to get the bulk mixed nuts at a decent price (I refuse to pay the prices at most grocery stores), and I’ll be honest, I’ve been too lazy to get a little container to put peanut or almond butter in. I could hard boil a bunch of eggs to have ready and take with me, but here again – too lazy, too busy. Gah. Many times this last week, my snack has ended up being 15-20 grams carb only, without the protein. That’s less than ideal because besides regulating blood sugar, protein helps a snack be more satisfying for longer. As I gradually add in diabetes recommendations to follow, I have to say that there is a LOT to it. I hear that from my patients all the time, and they aren’t kidding. Remembering to pack a lunch is pretty much habit, but the snacks are often a last-minute afterthought and making sure there’s protein with them seems like a nice idea that only happens when the planets align just right. Anyway, this is all good experience for me as an RD and it backs up what I hope I communicate to my patients: do the best you can, take one step at a time, and be prepared that life is going to push you back. Life happens. Life gets crazy. Motivation comes and goes. Just be steady and do your best. After all, your life is worth fighting for! I gotta tell ya folks, sticking to the diabetes recommendations is exhausting, especially when life gets busy. With Halloween festivities and a rapidly filling schedule I’ve found it tougher to stick with the recommendations this week. I did overdo my official dinner carb budget on Halloween, but I did it in a planned and intentional way. I spread my carbs out throughout the evening and only exceeded my carb budget by 15 grams. And that’s okay. It’s another case against the “diet mindset”: the recommendations are not hard and fast rules and it’s ultimately your life – you get to decide when to push on the guardrails, how often, and how far. The results are yours to own. It’s going to be particularly tough this upcoming week, as I’m adding in goals to move for 3 minutes for every 30 minutes of sitting, check blood sugars daily, give myself a syringe poke daily (to simulate an insulin injection), and take a daily vitamin (to simulate taking oral medication for diabetes). It is definitely feeling a bit daunting, and I am only committed to this for another week! The mental and emotional burden of managing diabetes is very, very real and goes far beyond what I’m facing here. When I don’t meet the recommendations, my body compensates and I chalk it up as a “Whoopsie, I’ll do better next time.” While that mindset applies for someone who has diabetes, they have the additional awareness that ongoing “whoopsies” can really do them harm. For all those with diabetes, I salute you. Your road is not an easy one to walk. The obstacles and struggles on your journey can lead to diabetes burnout , which happens to everyone with diabetes from time to time. If you do feel lost, overwhelmed, or depressed (people with diabetes are more likely to be depressed, and depression worsens control of diabetes), please seek out some support and resources. 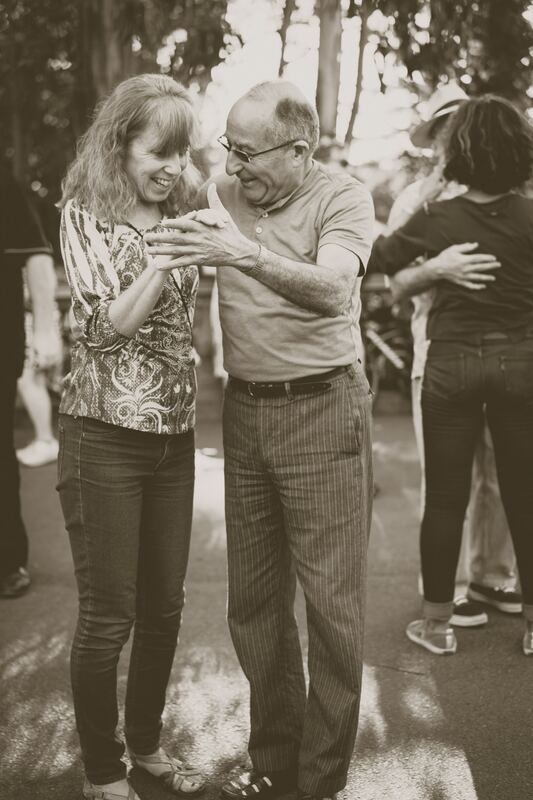 A great care team, support group, dietitian, or even resources at www.diabetes.org can really help bolster your spirit and help you navigate all those tough barriers. You are not alone! Hey everyone! The American Diabetes Association just released new recommendations for physical activity for managing blood sugar and I figured I’d share them since I’m carb counting at the moment! In addition to getting 30 minutes of activity most days of the week, they also recommend spending 3 minutes doing gentle movement for every 30 minutes you spend sitting. This helps send sugar from the blood into the cell and also improves circulation, which can be poor in people with diabetes. Not sitting too long is a fantastic idea, but for me the biggest challenge is remembering to do it! I have heard about some apps that are designed to help you get up and move more often, so I think I’ll give those a shot this week to try it out. I’ll be testing out Move – Daily Activity to Stay Healthy that gives you specific little activities to do at regular intervals, and Stand Up! The Work Break Timer, which lets you select time intervals anywhere between 5 minutes and 2 hours while at work to remind you to get up and move. Update: You can find my reviews of these two apps here. I love pumpkin in the fall. Love it. Stereotypes be darned, I do not care. This scrumptious squash finds its way into curries, soups, muffins, cookies, pancakes, and steamers around my house as soon as the leaves start to turn. Pumpkin takes a front seat in this seasonal smoothie that is filling, nutritious, and delectable. 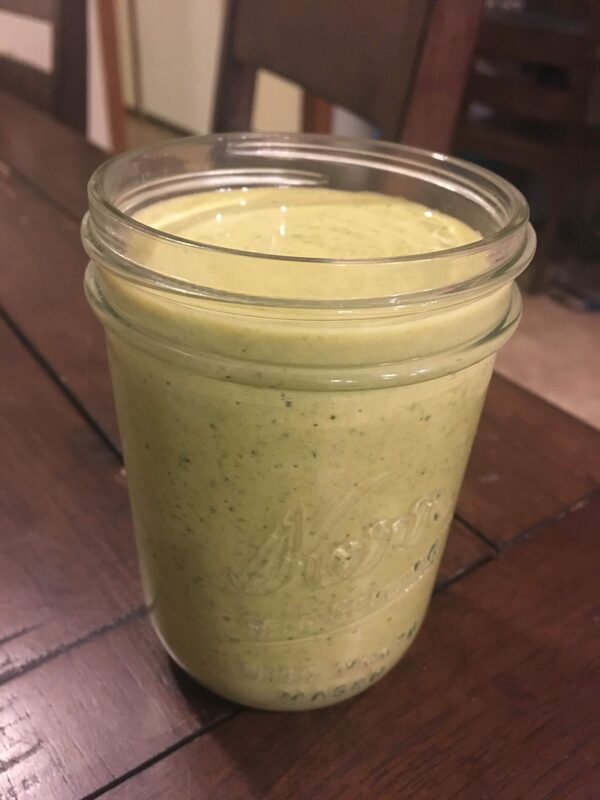 I started with the Pumpkin Pie Smoothie recipe here and modified it to boost the protein, control the carbs, and add some greens, because if you’re making a shake, why not add greens? You can’t taste them and it’s an easy-as-pie (…see what I did there?) way to get an extra serving of veggies. Try it for a tasty breakfast that is (bonus!) carb-controlled, heart healthy, and contains servings from 4 different food groups. Add almond milk and greens to blender. 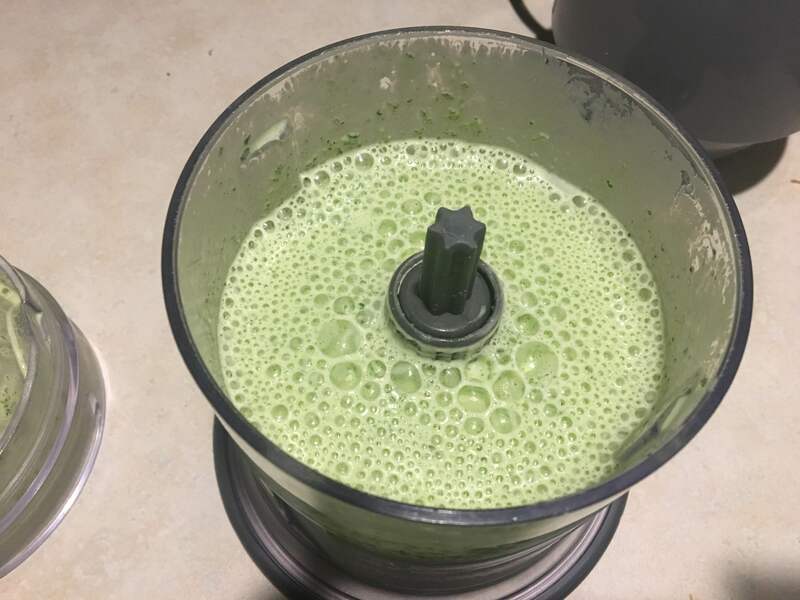 Blend for 30-60 seconds or until leaves have been completely blended and the mixture looks like green, frothy milk. Add remaining ingredients. Blend until smooth. Enjoy! Makes 1 16-oz serving. Contains 303 calories, 35.1 g carbohydrate, 14.6 g protein, 2.9 g fat, 0.1 g saturated fat, and 251 mg sodium. Includes 1 serving dairy, 1 serving fruit, 1 serving vegetables, and 1.5 oz protein. So far, we’ve covered carbohydrate counting as the primary method of managing blood sugars. It is by far the most important nutritional factor to pay attention to. There are, however, other lifestyle factors that affect blood sugar and are critical to know. Stress – This one is HUGE. Stress of many kinds raises levels of a hormone called cortisol that raises blood sugar (1). It’s important to keep in mind here that stress is more than mental and emotional stress (bills, relational issues, busy schedules…you get the picture). It also includes physiological stress (think chronic pain, poor sleep quality and/or quantity, infections, illness, etc) that may not come to mind when we think of the word stress. It is important to make a priority of identifying effective methods of managing stress by addressing the roots of these issues. Mental/emotional stress – The “best” methods of stress management vary for each person but good options include yoga, walking, meditation, deep breathing, and enjoyable hobbies. If you struggle with depression, anxiety, or trauma that causes ongoing stress, find a qualified counselor you trust to help you work through these very real and overwhelming conditions. Physiological stress – Pursue the root cause of your physiological stress. If you suffer from chronic pain, discuss pain management options with your doctor (there are many options beyond pain pills!) or talk with a Registered Dietitian who is knowledgeable about methods of eating to reduce inflammation. If you have poor sleep quality, practice good sleep hygiene habits and consider asking your doctor to have a sleep study done (especially if you snore!) to see if you might have a potentially serious condition called sleep apnea. Physical inactivity – Our bodies are designed to move and groove. Doing so activates receptors to let more sugar out of the blood and into the cell to make the extra energy we need for all that movement. My favorite part about the benefit of exercise for blood sugar is that just 30 minutes of moderate exercise (brisk walking, dancing, swimming, biking – whatever you like!) can improve blood sugars for 1-2 days afterward (2). Talk about return on your time investment! Inflammation – Inflammation is a type of stress, so I could have included it under physiological stressors, but it’s such a big deal I felt it deserved its own bullet point. Type 2 diabetes is an inflammatory disease, and inflammation is one of the causes of the insulin resistance that is a precursor to type 2 diabetes. Reducing inflammation through exercise, anti-inflammatory eating, and achieving a healthful weight can significantly improve blood sugars (3). Medications – Certain medications can raise blood sugar significantly in some people. This typically resolves after they stop taking the medications, but not always. For people with diabetes, these meds raise blood sugars even farther. Taking these medications is not always avoidable, but if you’re concerned about your blood sugars, check the side effects on any medications you take and discuss them with your doctor. Colberg, SR, et al. (2010) “Exercise and Type 2 Diabetes: American College of Sports Medicine and the American Diabetes Association: Joint Position Statement.” Medicine and Science in Sports and Exercise, 42(12). Retrieved from http://europepmc.org/abstract/med/21084931. Shoelson S, Lee J, & Goldfine A. (2006) Inflammation and Insulin Resistance.” The Journal of Clinical Investigation, 116. Retrieved from http://www.jci.org/articles/view/29069?search%5Babstract_text%5D=&search%5Barticle_text%5D=&search%5Bauthors_text%5D=&search%5Bfpage%5D=1793&search%5Bissue%5D=&search%5Btitle_text%5D=&search%5Bvolume%5D=116. Today ends week 1 on carbohydrate counting and I gotta tell ya, this is my favorite “diet” by far. It doesn’t even really feel like a diet. 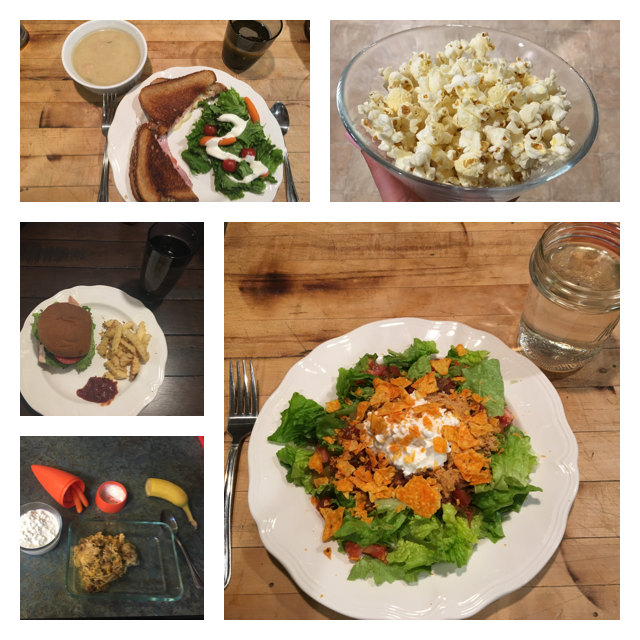 I mean, check out some of the awesome meals I got to eat! I think part of the reason it feels easy is that I have taught the principles so many times that I didn’t have much of a learning curve as far as learning how to carb count. I could recite carbohydrate portion sizes in my sleep…as a matter of fact, I probably do. You’d have to ask my husband. 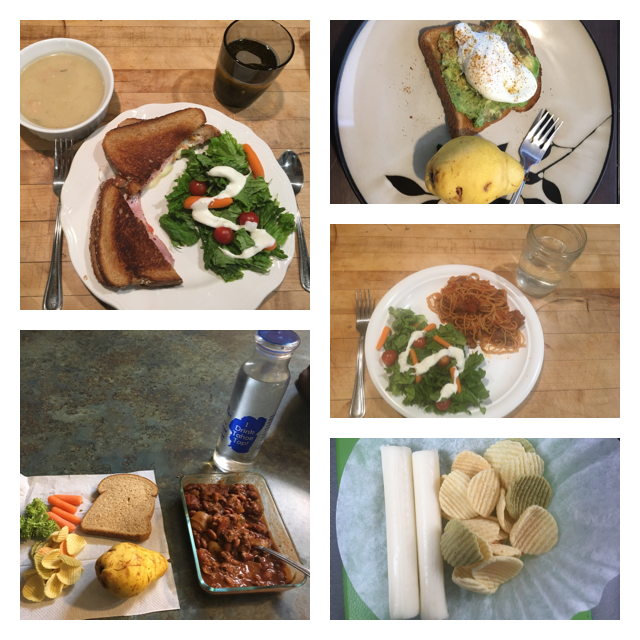 The greatest part about carb counting is that it is not very restrictive IF you are intentional about balancing your plate with non-carbohydrate foods. You can eat pretty much anything, the most important keys are how much and when. There have only been one or two times throughout the week when there was something I wanted more of but I had already run out of carbohydrates. Carb counting feels more like a guardrail than a diet – there to guide me in the right direction and keep me from flying off a cliff on a carb binge. The most difficult part has been boring beverages. Most of the time I would rather spend my carbohydrates on food than on beverages, which leaves me with tea only rather than tea and juice with breakfast and water instead of milk or a glass of wine with dinner. Overall, not that big of a deal but I have to admit I do miss drinking a glass of milk in the evening. Though this particular meal plan has been very flexible, I’m looking forward to carb counting on my own and seeing how well I can do flying solo!